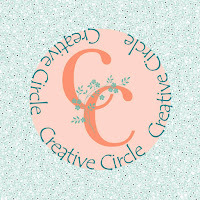 Hello and welcome to the Creative Circle Design Team Blog Hop for June. If you have arrived from Carol's blog, you are in the right place. If you are starting here, be sure to follow the links at the end of this post to see all the team's creations. This month we were challenged to do a favorite 3D and/or card. I did both. As you know, I love Liz' suitcase pattern and I was excited to design something a little different with it. 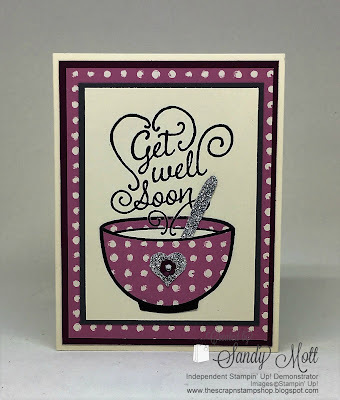 And since this month was "anything goes", I decided to use the "Get Well Soup" stamp. I've had the stamp for almost a year and this is the first time I've used it. All last winter I thought about making this type of project with it and I'm thrilled that it carried over into the 2016-2017 Catalog. Even though flu season is mostly over, people still get those nasty summer colds. 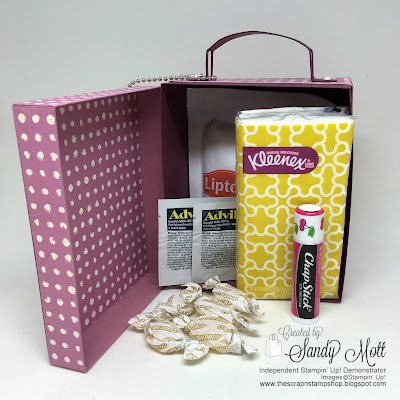 I believe my project would make anyone with a cold/flu feel a lot better! This little suitcase (box) is full of cold remedies. 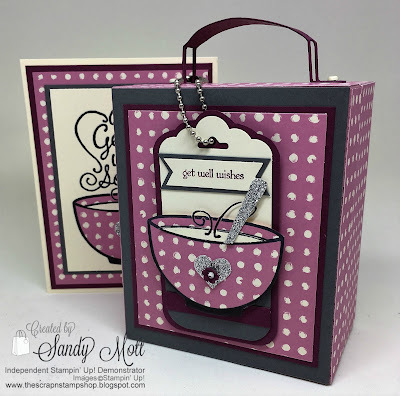 I combined the new Sweet Sugarplum with Raspberry Ripple, Basic Gray, and Very Vanilla cardstocks. I really like this color combo. I used the new "Playful Palette" Designer Series Paper (one of the Sweet Sugarplum designs) - and I can tell already that it will be a favorite. I stamped twice, once on Very Vanilla and once on the printed paper. I fussy-cut the soup bowl (and the soup) and cut the spoon and heart out of Silver Glimmer Paper. 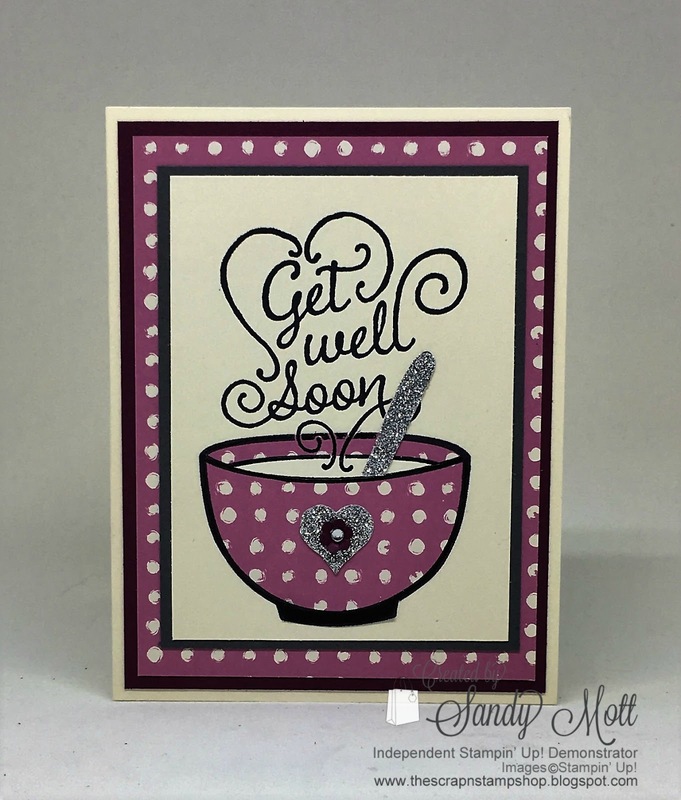 I added the Glimmer paper because even when you're sick, a girl's got to have a little bling. This stamp is so easy to work with because it's just one stamp. No decisions needed to be made about where to put it. Perfect. This suitcase (turned into cold remedy box) has a lot of room inside. I added a package of Lipton Noodle Soup, two Advil packets, a purse-sized Kleenex pack, Chapstick, and about six cough drops. There was still room for more, but you get the idea. If I get sick, I know I would feel a lot better getting this from a friend. 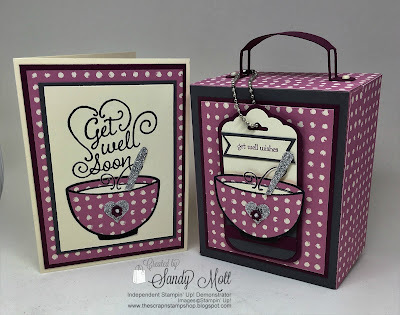 I liked it so much, I made another one using the new "Pop of Paradise" designer series paper. Hope you enjoyed my projects. I would love for you to tell me which one of my two color schemes you liked the best. You can purchase Liz Holloway's suitcase pattern here. Now let's go see what beautiful project Liz has created for us. Be sure to follow the hop by clicking on the button below. If you get lost, just click on the names listed under that. We have two new team members and I know you'll be thrilled with their creations. Would you like to be a member of the CCDT? We would love for you to join us. We're looking for seven (7) enthusiastic designers. 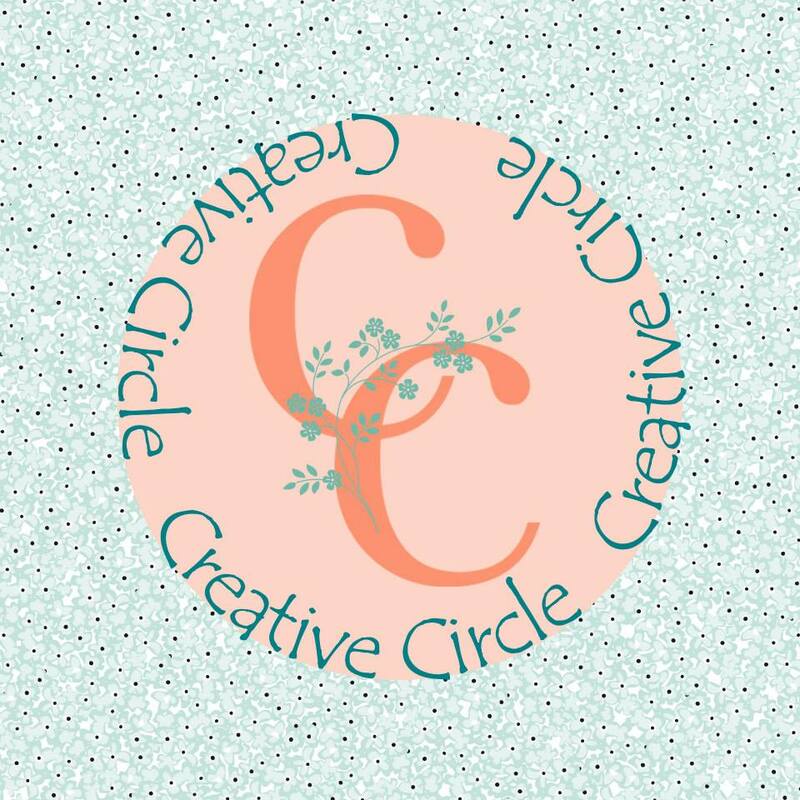 If you love paper crafting in relation to (but not limited to) card designing, art journaling, scrapbooking, etc., and have your own Blog, electronic cutter, and Facebook (which you post to regularly), then we would love for you to apply. You must be an active Stampin' Up! Demonstrator. No previous design team experience is necessary, so don't be bashful! The Design Team call is open to everyone worldwide that would like to apply. The CCDT term will be for 6 months (from July 2016 to December 2016) and will be reviewed at that time. We hop once per month, being on the first Thursday of each month. 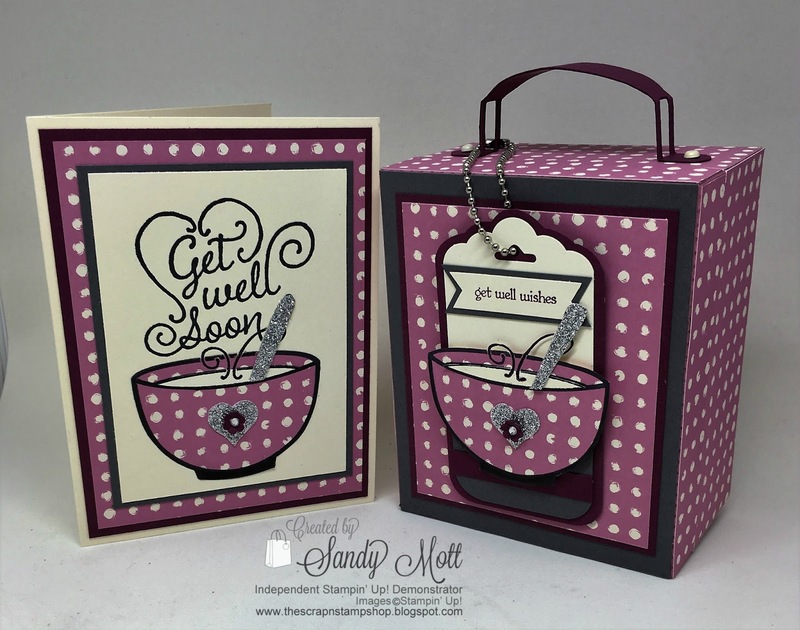 Every third month will include a 3D (designed by Liz Holloway) and one card. The first and second month will be a card of your choice using a pre-determined theme. We'd love to have you join us! Contact Liz Holloway at: liz.holloway@gmail.com with your application, including blog name and designs. 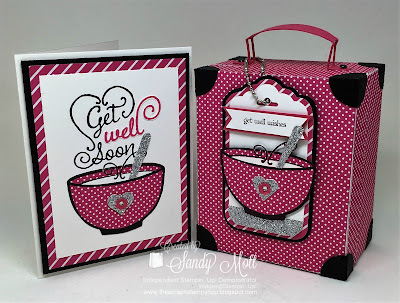 Love the suitcase pattern and your cold remedy gift idea! Both versions are pretty, though I am partial to the colors in the first one. Summer colds are the worst and this will certainly help make someone feel better. Thanks so much Lisa! I'm loving the colors on the first one as well. Absolutely love this project & your creativity! Almost makes me want to be sick just to receive one! Thank you Vickie! Not to worry - if you get the bug, this one's yours! What a great job! Wish I knew someone sick, doesn't that sound awful, but just so I could copy your super ideas. Who wouldn't feel better after receiving one or both of those. Although I personally like the Pop Of Paradise pack better, I do like the choice on the Playful Palette better here. Love 'em! Thank you so much Carol! One of my friends said she was sick, could she have one? Ha!! 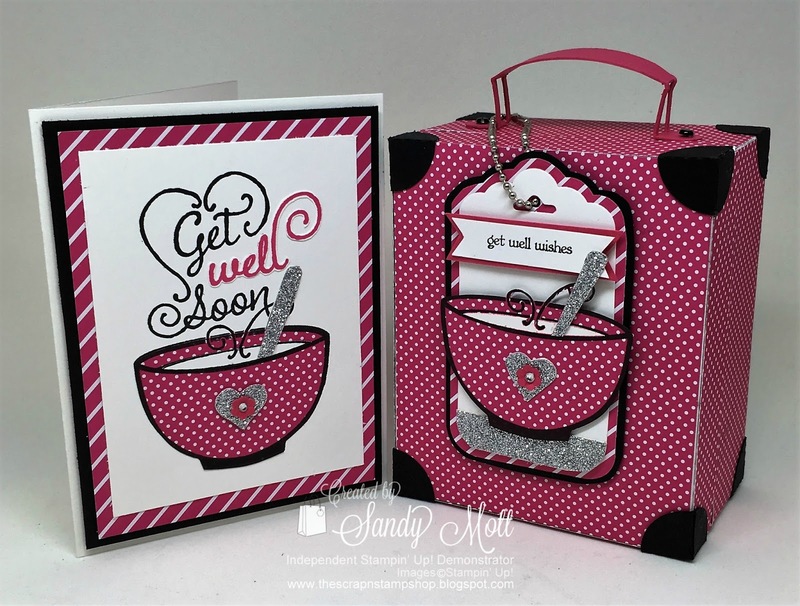 Sandy- I just love these get well projects- I think they would sell great at craft fairs too! TFS! Thanks Lynn! I agree with you that they would sell well. You come up with some great ideas using these patterns. Can't wait to see more! Thanks Liz - that's because you make great 3D patterns! They are so fun to work with and I love their versatility! I LOVE all of your creations! This one is no exception! So clever, cute, and useful! LOVE IT!